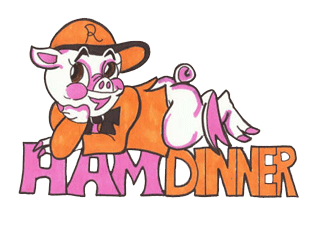 The Ham Dinner is one of the biggest fundraisers next to the Christmas House Tour. The proceeds are vital to keeping our Community Center going. The Community Center is a very important part of our Village. There is much work and planning to be done so that this Center will always be a part of our community. We want every one to be a part of it. This is your future! At this time it might not look like a lot of work has been done since we have taken over charge of the building, but we are making progress. In the past, we have asked people of the Village to please help at any time they were able. But, now we would like to hear from you as to when you can help. Many of the same people show up for what they always do, and then there are times when something comes up, and they aren’t able to make it. If you know that you’re not going to be there, please call Janet 267-4996. 10 years or younger must have a parent with them. 19:00 - 21:00 Thursday, April 30: Set up tables and chairs, clean bathrooms and anything else that might need to be cleaned. 10:00 - 11:00 Friday, May 1: Cook and peel sweet potatoes. Bring a friend! We'll be done before noon with many hands. The more the merrier! 18:00 - 20:00 Friday, May 1: Essential! Essential because the more people we have the earlier we all can go home: Peel and cut white potatoes. We also will be slicing sweet potatoes. We also will need people to set tables in the dining room. As we all know, the more we can do on Friday evening, the less we have to do on Saturday. 19:00 - 19:30 Friday, May 1: We are asking anyone who will be serving in the dining room on Saturday to please stop down at the Center for table assignment. 10:00 - 10:00 Saturday, May 2, 8:00AM: open the hams so that they are ready to be delivered to the homes by 9:30 a.m.
10:00 - 10:00 Saturday, May 2, 9:00AM: prepare items for the dinner. Also, we will need to set up the take-out counter. Many things need to be done from Friday morning into Saturday. Please call Janet (609-267-4996) if you can bake a ham. 15:00 - 19:00 Saturday, May 2: We need everyone to be at the Center by 3:00 p.m. to have everything ready to go by 4:00 p.m.
19:00 - 21:00 Saturday, May 2: Help is needed after the dinner to take down tables, chairs, wash pots, etc.